I had not driven a Buick in quite a while and all I kept wondering was if the ubiquitous claims that GM makes about the re-invented brand are true. 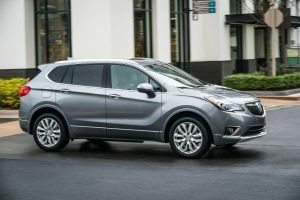 As it turns out, their claims are remarkably accurate with the restyled 2019 Envision. As we all know, there is an ongoing exodus from the traditional sedan to SUV’s. People like the comfort, ease of entry and exit and the overall look and feel of a taller vehicle. Thus, GM is scrambling to fill this expanding and profitable segment and it’s doing it quite well. 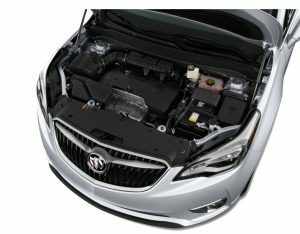 The Envision is Buick’s midsize SUV offering, which had a mild restyling for 2019. This includes new bumpers, grill and tail-lights, making the exterior look a bit more contemporary together with typical GM corporate design cues. Of course, you cannot have a Buick without the iconic “port-holes” that date back to 1948. In the case of the Envision, these are located on the back corners of the hood instead of on the side of the fenders. Inside the cabin, you are greeted by an elegant interior, featuring plenty of leather and a pleasant design throughout. The infotainment is a breeze to use and understand, offering Apple CarPlay and easy connectivity. There are plenty of cubby holes and nooks for storage of all the daily items we all seem to carry around. From a nifty, mid-dash smart phone wireless charger to plenty of cup-holders and USB ports throughout. Rear seats are comfortable for two, a bit tight for three. One big advantage is the almost flat floor in the rear seating area, improving the center-seat comfort dramatically. Rear cargo space is typical for this size SUV with an electric hatch and a well-appointed area. 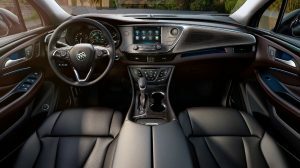 Overall, the interior fit and finish is noticeably improved over legacy GM products, the touch areas have a pleasant feel to them as do the switch gear, thus creating a definite sense of luxury. There was one exception however, the climate control “warm” and “cold” buttons needed a surprisingly hefty push to make them react. A software glitch on our test-car, perhaps? Living in South Florida, one gets to know very quickly if a car is comfortable to live with or not by simply doing two things: Driving the daily stop-and-go heavy traffic and paying attention if the AC works well. In the case of the Envision, it passed both tests with flying colors. I like to go a step further by seeing how comfortable my passengers remain while in traffic, which reminds me of a story. Ever notice, some cars have a throttle and brake that act more like on-off switches? Well GM seems to have figured it out by doing a great job in the art of the delicate and slight pedal inputs needed to make the driving experience smooth and comfortable. Bravo GM! How does it drive? Well beside crawling in traffic, I did manage to drive the Envision for over 200 miles during our week with it and I thoroughly enjoyed it. Highway driving is this mid-sized SUV’s strong suit. I’d have no problem driving it for over 800 miles in one day and still feel comfortable and relaxed. The visibility is good throughout and the seating position is just right. The 2.0-liter turbo engine has a nice linear response to it, even though some have called it under-powered. I think its fine for the great majority of the duties the Envision will typically do. Steering feedback is on the soft side and brakes and suspension are smooth and easy to live with. Turning, parking, reversing and getting in and out are all excellent. The Envision does everything you want it to do right, with a nice dash of elegance and luxury. 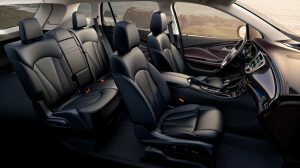 If you are looking for a luxury, mid-sized SUV, the 2019 Envision needs to be on your short list. Other models that compete against the Envision include: Acura RDX, Lincoln MKC, Lexus RX Series and Infiniti QX50. So, the verdict? Five Stars! from Motoringstyle.com. 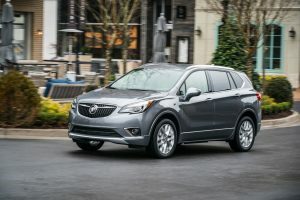 I was pleasantly surprised with the 2019 Buick Envision and you will be too!